As long as our souls inhabit these earthly bodies, soul music might never die, but let’s be honest here; there just simply isn’t that many soul legends around anymore. The passing of Aretha this year really hit home for a lot of us, sending a wake-up call to those still hungry for the “real thing, baby.” Anyone with a heart for this amazing genre should be rushing to every corner of civilization to witness these greats, before their time on Earth expires. For Patti LaBelle, her fire is still burning. She’s showing off her acting chops with her recurring role on OWN’s Greenleaf and branching the LaBelle enterprise out to covering cookbooks, fashion and Patti sweet potato pies. She’s still recording music (2017’s Bel Hommage unveiled her very first foray into jazz). 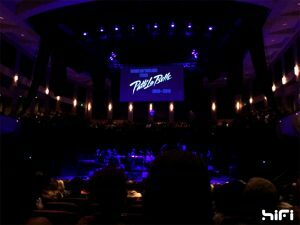 And in Birmingham, at a Sunday sold-out show inside the illustrious 1,330-seat Alys Stephens Performing Arts Center on the campus of the University of Alabama in Birmingham, she uttered her plans to not stop working or recording. 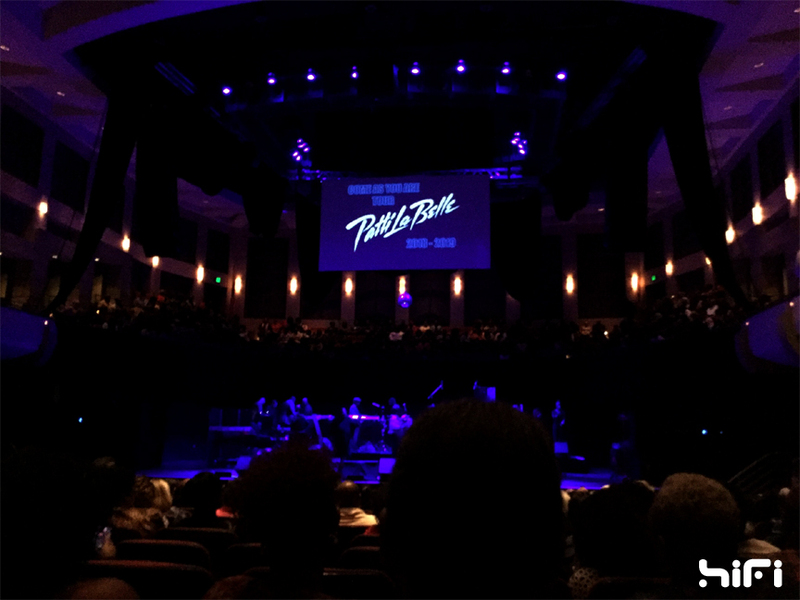 In complete awe of the concert hall and its master craft acoustics, the two-time Grammy award-winner even entertained the idea of doing a recording in that very spot. After an animated slideshow possessing archived photos blessed a raised projector screen and a sophisticated band prelude, LaBelle, 74, took to the stage with a fiery throwdown of the New Jack Swing-powered “Feels Like Another One.” Afterward, she takes a good breather, relaxes some and gives the crowd some old-fashioned hospitality coming from a vivacious Philly soul sistah. “I’m gonna take my time tonight. No rush,” the Philadelphia native told the enthusiastic crowd. Then the first notes of the Diane Warren-penned “If You Asked Me To” echo throughout the room, and she prefaces her performance with a warning. Celine Dion made this tune famous, but “don’t get it twisted; I did it first.” And with a bit of relaxation and a heavy dose of improvisation, the tune is carefully milked like a Luther slow jam. “If Only You Knew” immediately follows and the crowd joins in on a sweet singalong. LaBelle loves to interact with the crowd. She feeds off of them, their energy, their sudden outbursts. And a lot of that happens, ultimately making a night of unpredictability and hilarious surprise. As a continuous thread of hilarity during the night, LaBelle’s first pair of high heels are too high for her to stick with throughout the first half and she wants to bail on them. And apparently, she and her management can’t find the pair she wants to wear. So a crowd participant sitting in the balcony behind her, a zealous fan named “Icon.” offers his shoes. She accepts the offer. Suddenly, the shoes are tossed all the way down to the stage. And like a cliffhanger to a fairy tale, LaBelle discovers the pair is quite comfortable, but a size or two too large. She settles in wearing them for a few song selections, but gets another volunteer shoe offer, this coming from local radio personality (and close friend) Binne Myles. They share the same foot size, so this should be no problem. Right? Well, the audience bursts into a bevy of laughs when she yells out that the shoes were put on the wrong feet (see below). John Stanley, LaBelle’s musical director, then rushes from the piano to her side and aides her in the correction, in an exercise that looks like an ‘I Love Lucy’ skit. When the second half enters and with a quick wardrobe change into a glorious green pantsuit with a black wig, she discovers the pants are slipping a little. LaBelle then sends out an S.O.S. for a bobby pin. “Icon” extends his broche to the real icon in the room but it doesn’t solve the problem. After a few light laughs in an impromptu skit deserving of Tyler Perry’s attention, LaBelle drops every ounce of divadom. “The show must go” becomes her mantra. Musically LaBelle sounded vibrant and strong, hitting mountaintop wails and giant soulful swoops with very little strain. None of the arrangements are transposed to lower keys, a twilight resort often used on industry fading roses. And with a powerhouse band behind her including the likes of B.Slade (formerly known as Tonex’) on percussion and guest lead vocals, gospel legend Brenda Roy on background, Philly trombonist Jeff Bradshaw and the gifted Stanley on grand piano, she pulled off an advantageous live show that flared with the best of gutsy funk and symphonic soul. “Right Kind of Lover” got a peppered go-go update, while the often-sampled “Love, Need and Want You,” another song that got an “I did it first” memo, was dressed like a romantic lullaby. B. Slade roused the crowd halfway into the set with a remixed funky Frankenstein of “Love and Happiness,” even singing lyrics of the theme song to The Jeffersons, and returning with a spot-on vocal impersonation of Michael McDonald on a slightly-sped up “On My Own.” More audience singalongs came about on the chorus of “Somebody Loves You Baby,” “If You Don’t Know Me By Now” and the Sunday morning bliss of “Every Praise.” LaBelle’s faith, one that continues to overcome health challenges like diabetes and the loss of her two sisters to cancer, was on full blast in the second half, exhibited on the latter song, along with “You Are My Friend,” a song penned by her along with her late musical director Budd Ellison. 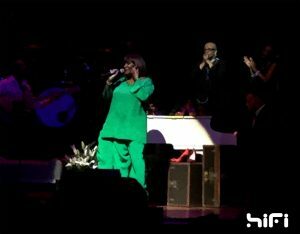 And before she belts out the first line of the song, LaBelle dedicates the tune to Aretha. It’s a tender moment that reminds us all of the brevity of life and that soul begets soul; “You Are My Friend,” styled like an Aretha power ballad, is tuned up with such raw emotion as it gives a heartwarming salute (“The thought of you helps me carry on”) and takes flight with the addendum of the gospel hymn “What a Friend We Have in Jesus.” It is followed with an instrumental overture of “When You’ve Been Blessed” and her beloved gospel soul recreation of “Over the Rainbow,” her forever show climax. Her high heels are tossed into the air once again as she zooms up a flight of notes on the closing minutes, and the audience responds with a standing O.